Due to recent reports of fraud around the country at other banks and credit unions, Latitude 32 Credit Union wants to provide you with a way to help protect the security of your debit card. The best way to start is by changing your PIN today. We all like to keep the same PIN year after year for convenience, but it's also convenient access for a potential hacker. Latitude 32 Credit Union has not experienced the compromise other institutions are having; however, we are being proactive and making the recommendation that you change your PIN today. It's very easy and only takes about thirty seconds. 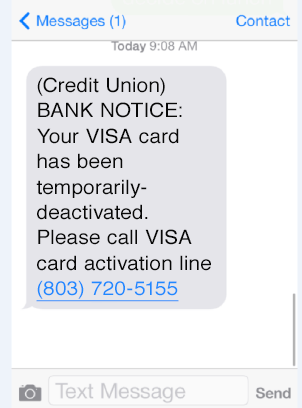 The text shown in this screenshot is NOT from Latitude 32 Credit Union. This is not our activation number, nor do we have a system in place that would text you about activation/deactivation. If you call the number it sounds very real, but if you follow the prompts it will ask you to enter your card number and PIN. DO NOT DO THIS. Automated communication from Latitude 32 will never ask you for this information. If you receive a text like this, please DO NOT call the number given in the text. If you have any concerns about the status of your account(s), please contact Latitude 32 directly by calling (843) 556-4809. You can stop by Latitude 32 and sign up. Our staff will take care of everything. Please provide us with a valid email address. You can sign up for E-Statements online. Below are the steps to sign up today! You log into your account and Go to products and services. At the bottom of that page will be a place to input your email (must match email on file) and then you will click “agree” to the terms and conditions. The next screen will show you the statements available; including the most current to what history is available as well as a copy of the disclosure you just agreed to. It’s that simple. Once you sign up and click agree, you will no longer receive paper statements. You will be saving trees, saving time, and helping Latitude 32 save money. Still not convinced? Here are some great reasons to switch to E-Statements today! Click Here!